Editor's Note: Today in Dallas I am wearing a new dress and new shoes from J.Crew. Happy Wednesday everyone! It is hump day even though it feels like Tuesday to me. Today Michelle and I are off to the Design District in Dallas for the first time in weeks. I am so happy to have our office move behind us even though I have one more move ahead of me--moving out of my old home. Can't say that I am looking forward to that this weekend but I will be bringing more treasure to my office. As I talked about in my Thomas O'Brien blog yesterday I love it when the past and the present come together! It gives the whole space a feeling of unity. I am fortunate enough that my ceilings are so tall in my new office that I am able to display a lot of my art. I love showing off my new design studio to friends and clients and telling all the stories behind everything that is in here. I truly have collected art and antiques with passion since I was 22 years old. Michelle and I are starting work on a new job this week that I am very excited about because she is a long-term friend of mine. I am also very excited about being back in my zone on Wednesday and not moving with shorts on. As I said yesterday the new issue of Veranda is incredible and today I am featuring an article about Cathy Graham and her Nantucket home. Cathy has a new book "Second Bloom: Cathy Graham's Art Of The Table" where she talks about entertaining and her floral wisdom. Cathy study floral design in London with Jane Packer and also worked with the late event planner Robert Isabell. Her love for flowers and entertaining is very evident in the article. I would love to attend one of her dinner parties--who knows maybe some day! Make it a great day everyone! 4th of July is coming up! What a precious house! Very Nantucket! I adore the new dawn climbing roses that are cascading down the house. This house looks like a storybook cottage. Isn't Cathy Graham precious?! Happy in her garden with her apron on and her hat and her arm full of flowers! What a beautiful garden and I love the gravel pathways! It crunches so great underneath your feet. What a plothora of flowers to cut and bring inside. How special is that?! With flowers all in different buckets this looks like one of my scenes of doing Design Inspiration flowers. I build my flower arrangements as I go with many choices to choose from. I love all the white in this room! So happy! What a precious kitchen table and look at the shades above with the blue and white check! Love love the place settings as well! Beautifully set table with all sorts of different vases and candlesticks! This whole room is so charming and so unbelievably happy! Cathy paints her own paper lamp shades for her parties. You can see two of them on this table. How special! What a great touch! Another beautiful view of her flowers with sea shells. I love having collections of things on tables. One of the favorites that I have done in the past is with herend. I love pulling from my huge collection! Rocking chairs on a veranda--just says summer time! What a beautiful table using peaches, lemons, and cherries as the floral arrangement! What fabulous green dishes! This party looks fun before anyone sits down. 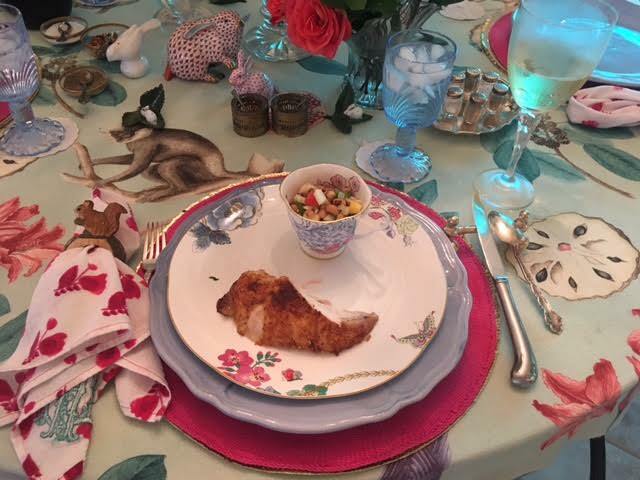 Dinner last night was roasted chicken and Texas caviar from Central Market! Delicious! I am really loving all the Sade music that I have downloaded recently. It reminds me of happy times in the 80's.